Many reviewers will pay attention to this split, since it probably represents a pair of most flagship Hells Headbangers bands next to Nunslaughter and Acid Witch. Midnight has not released something new in a while, and Shitfucker (no comments on the moniker) don't give the slightest shitfuck about what anybody thinks. I guess the 7” came out in preparation for Hells Headbash, part 2, where both bands are probably scheduled to make appearance. 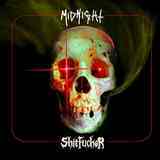 On Sadist Sodomystic Seducer Midnight delivers their signature catchy blackened speed metal with punk rock throw-caution-to-the-wind attitude, although I can't call Sadist Sodomystic Seducer one of Midnight’s best tracks ever. Yet there is a melodic fling after around 1’30”, it is headbang galore and, most importantly, you can hear the music and even lyrics clearly, while no one would ever call Sadist Sodomystic Seducer “cleanly produced”. At the same time Shitfucker’s Nightmare pt.2 (not sure when Nightmare pt.1 was delivered, or if there was one) is basically a garbled mess. Drums are hissing somewhere in the background and are hardly heard. Bass is more intense, but also a bit away in the mix, coming off as persistent booming air conditioner motor constantly running by my window, with vomit vocals occupying all possible space upfront. With a name like Shitfucker one shouldn't be expecting symphonic beauties, but Nightmare pt.2 is hardly listenable, even in some remote basement.